: An expression that cannot be understood from the meanings of its separate words but that has a separate meaning of its own. We love English idioms – if you look carefully at their literal meanings you will realise that most of them are very silly and some are even downright hilarious. If you’re currently learning English and have never been introduced to the wonderful world of idioms, then check out our list of our favourite funny English idioms – and try to see if you can use them when you speak English! One of the funniest idioms (in our opinion anyway) – as cool as a cucumber is used to describe someone who is calm, composed and untroubled by stress. 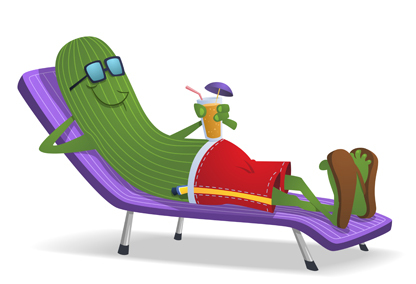 This idiom dates back to the 1730s, and we think it may be based on the fact that in hot weather the inside of a cucumber vegetable remains cooler than the air. Not just used to describe a tasty plate of spongey-goodness – a piece of cake is used to describe something which is really easy to do. Apparently this idiom originates from the Royal Air Force in the late 1930s, who used it to describe an easy mission. We can’t tell what this idiom is based on exactly, but we do know we could easily tuck into a piece of cake RIGHT NOW. 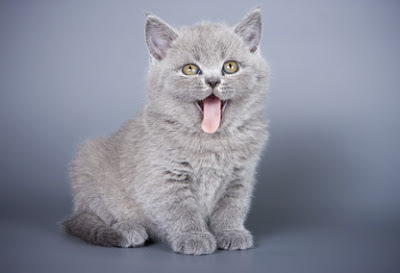 It would hurt SO MUCH if a cat actually bit your tongue that you wouldn’t be able to talk – and this idiom is directed at someone who isn't speaking. It is used to describe someone who is silent and is usually directed at someone who was quiet when they were expected to speak, as if to say “have you got nothing to say?” There doesn’t seem to be any evidence that this idiom originated from a cat actually biting off someone’s tongue, so we can presume that, like children’s nursery rhymes, this idiom may be a nonsensical invention. Don’t worry no one will actually be putting any socks anywhere – put a sock in it is an impolite way of telling someone to shut up and be quiet. The direct meaning of this idiom is unclear - it’s not really known why a sock is being used to keep someone quiet and what “it” refers to (we presume the mouth or whatever is causing the noise! ), however we do know that this expression began to pop up as early as the 20th century and is now a commonly used idiom. Have you ever seen a pig fly? Do pigs have wings? 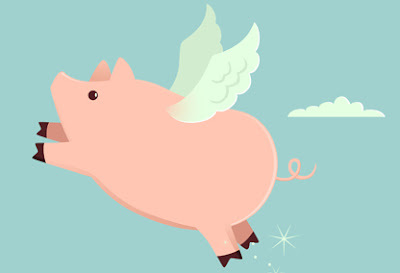 Obviously not, it is impossible for pigs to fly – which is precisely what this idiom means. It is used to describe something which will never happen. People often use it as a sarcastic reply to someone asking them to do something, indicating that they will never do this thing. Don’t worry, you won’t actually have to hold any horses, this idiom is used to tell someone that they are doing something too fast and they need to stop and consider their actions, decision or opinion on something. This idiom is directly linked to our four-legged friends, and is based on the times when people used horse-drawn carriages and needed to keep the horses under control, they would literally hold them back from running. Though this idiom sounds funny, this one actually has a sad meaning. 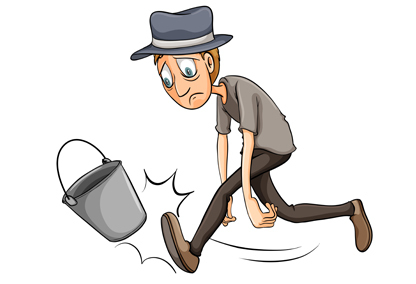 Kick the bucket is an informal or slang term meaning to die. The original reference for this is still unclear as kicking a bucket isn’t associated with dying, however one theory is that in the 16th century the wooden frame used to hold up animals for slaughter was called a bucket, and as they would struggle before death, hence kick the bucket was born. This quirky idiom originating from Britain roughly means “it’s as easy as that”, and is often used immediately after simple instructions to indicate that the process or action is very simple. Dating back to 1887, this phase comes from when the British Prime Minister at the time, Robert Cecil (Lord Sailsbury) appointed his nephew Arthur Balfour to the prestigious post of Chief Secretary for Ireland. The phrase was coined when Arthur referred to the Prime Minister as “uncle Bob” – clearly it was very easy to gain a successful position if Bob’s your uncle! This idiom is for the daydreamers – to have your head in the clouds is to be out of touch with the everyday world and to be living in a fantasy land, making you naive and unrealistic. Though it sounds nice to be living in your own world, this idiom is not used as a compliment and the speaker is usually trying to get the listener to consider the facts or reality of the situation. Similar in meaning to “head in the clouds”, the lights are on but nobody’s home is a light-hearted way of suggesting that a person lacks awareness or intelligence, and is also used when someone does not react to your question because they are distracted by something else. We believe it is based on if you go to a house and the lights are on you presume someone’s at home – so in the case of a person they appear to be “there” but they are not, they are distracted or are stupid. These are just 10 of our favourite idioms – have you heard of any others? Start a discussion with us in the comments or on Facebook and Twitter!